On the Bill Leff and Wendy Snyder Show on WGN Radio, HERE I always have lots of fun. We talk about a wide range of topics, including Quirky. We begin with a description from Wendy of what neutering her dog, Kona, is all about or not. I re-affirm what too many people still don’t seem to understand: NO responsible breeder will ever sell to a pet store. A pet store chain that sells dogs and cats was considering a move into Vernon Hills, but changed their minds. With Marc Ayers of the Humane Society of the United States, I spoke to Vernon Hall village trustees and also to the Village President/Mayor Roger Byrne. 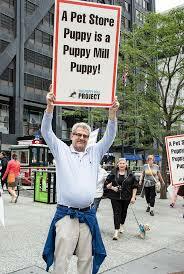 I mention how a Chicago pet store owner – who now refers to himself as a rescue – also spoke, but unfortunately filled his comments with misinformation. Here are further details on what was said on November 7 in Vernon Hills. 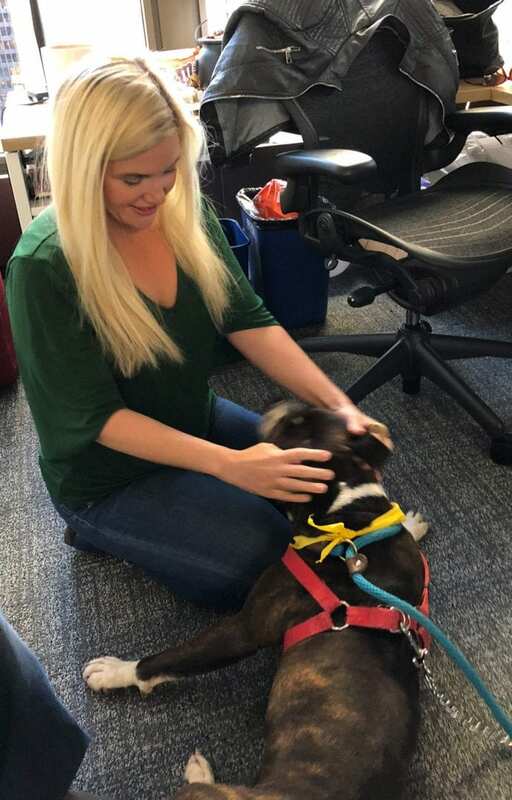 My record of adopting dogs on the Steve Cochran Show with Justin Kaufmann on WGN is nearly perfect – but we can’t seem to find Quirky a home. Quirky’s been at Chicago Animal Care and Control for over four months, far too long. 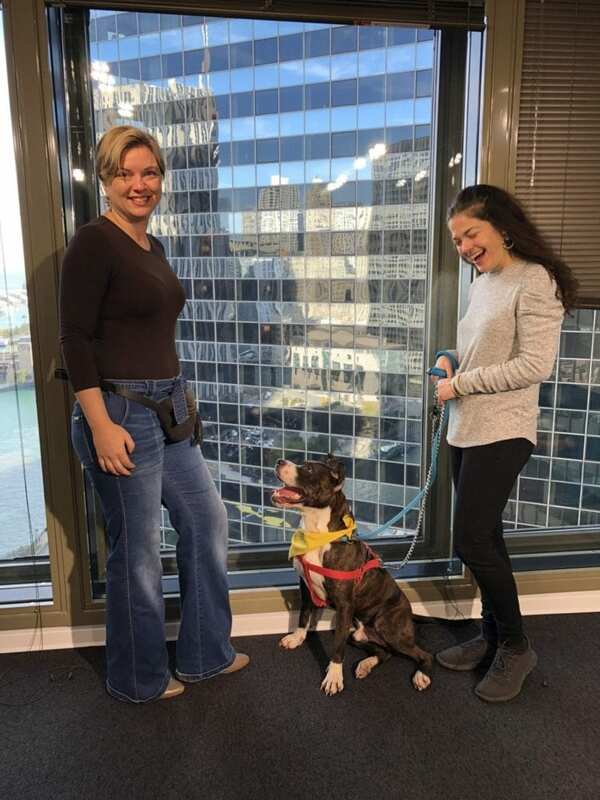 WGN employees ran out of their offices to see Quirky (featured image on this page with WGN program manager Stephanie Tichenor as Quirky visited her office and asked for an air shift on the weekend). Quirky responded to love by literally rolling over with joy. 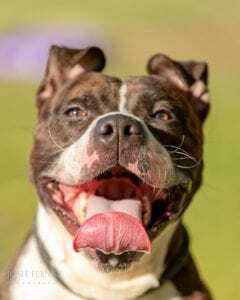 He is a total fun loving dog, a mix called a pit bull, But we’ve adopted similar looking dogs before, even one with three legs. Quirky is about six-years old, but he still has tons of energy and lives to party. Please help us to find Quirky a forever home. From today though November 18, adoptions at CACC celebrate Petsgiving, which means FEES ARE WAIVED for Quirky and all pets six months and older and for all adult bonded pairs. ➤Adoption requirements: bit.ly/adoptcacc. You must be 18 years or older. Bring photo ID and a bill/lease with your address. Renters: A lease or landlord’s permission required. All family members must meet the pet of your choice, and I hope that is Quirky. In the recent midterm elections, Florida voters decisively voted to shut down all Greyhound racing in the state. No longer will the approximately 7,000 Greyhounds in the state be confined to small wire cages or allegedly and according to media reports given dangerous drugs to enhance their performance. Dogs also won’t incur often serious injuries as a result racing. True enough that’s a lot of dogs who will be in need of homes. But this doesn’t have to happen to tomorrow – but the tracks don’t close until 2020. Still, Greyhound rescues will be very busy. And I speak some about misconceptions people may have about Greyhounds.